We usually say that seeing people paddling Bayou Fountain is our reward for all the work we do out there, but it’s not the only thing we get out of it. Sometimes, we come back with a great story. 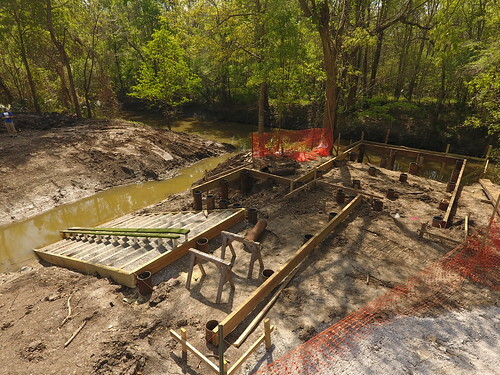 With the Bayou Fountain paddle launch at Highland Road Park coming along swimmingly (consider that foreshadowing if you didn’t watch the video first), we wanted to spend a bit of extra time getting everything on the bayou ship shape. The last thing we’d want would be to get a bunch of new paddlers out there only to have them run into something that should have been avoidable. So, Mike and I planned to spend a long day and take care of some of the borderline or impending issues. 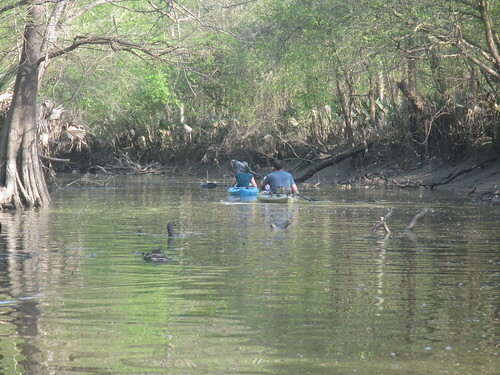 We figured we’d start at the end and work back, so the first order of business was a relaxing paddle down the bayou. We weren’t the only ones relaxing. 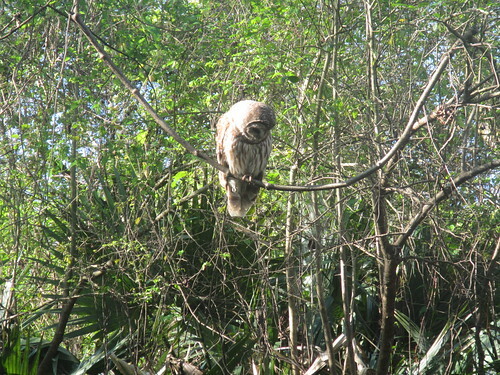 Along the way, we passed a sleeping owl who was perched right over the bayou. He woke from his nap as we quietly drifted by, and I managed to snap a quick photo just as he was waking up. It’s always a blast being calmly observed by an owl as you head down the bayou. We worked a few areas, and then we got to a tree that mostly fell last year. Recently, the large limb that had been partially supporting it had begun to fail, so it was time to deal with it. It’s much easier to handle before it’s underwater and causing a massive jam. It took about two hours to dismantle to what you see in the photo, which should be enough to prevent any obstruction, and it left us with a nice branch pile. That wasn’t the only thing it left us with, of course. We got a great story out of it, too. We were about an hour into the tree, when all of the sudden I heard an exclamation of dismay from Mike. 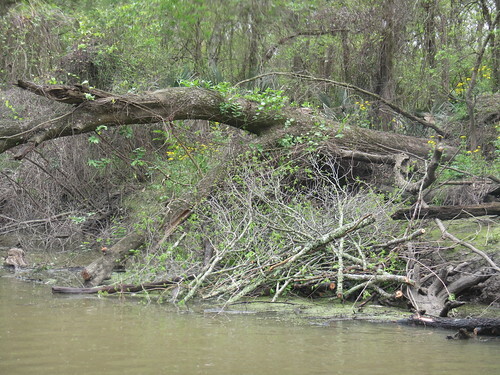 It seems a vine had snagged his glasses right off his face, tossing them into the bayou. He was so sure they were gone forever, but I wasn’t about to give up without a fight (well, a swim). As you can see in the video, we got the glasses back faster than we’d ever have hoped. We spent quite a bit of time polishing off the last mile of Bayou Fountain, and by eight hours into the work day, we figured we’d head back. Along the way, we saw one spindly, branchy fallen tree was catching too much, so we figured we’d do a quick five-minute job on it. Naturally, there was a cute little snake in the water in the middle of it all, so we politely shooed him off and started in. 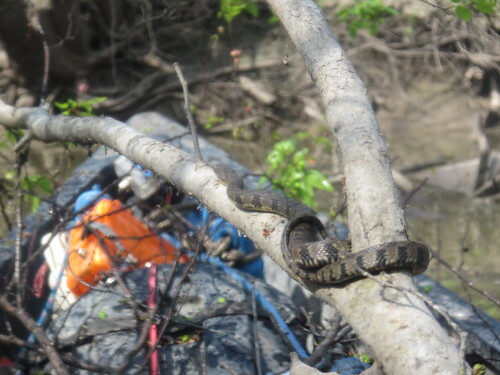 A few minutes later when I pulled one branch up onto my canoe, there he was again. I just had to pause for a photo op with our quiet but stubborn stowaway before lowering him back to the water and coaxing him on his way. Little guy was just trying to get some sun, but the branches had to go. 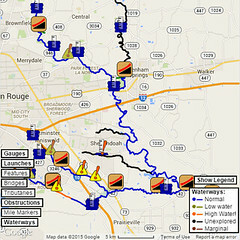 As for the launch, there are lots more pilings and beams since last week. It’s really coming together now, and not a bit too soon. Pulling the canoes back up the bank after a 10-hour work day really made us look forward to having a nice launch. 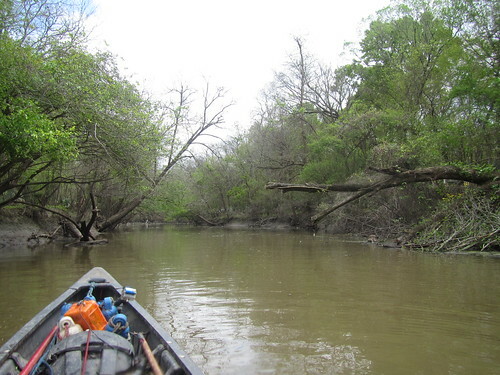 We’ll likely have similar dreams of easy access next week, as we’re planning to hit the bayou again for more pre-launch-launch paddle trail maintenance. We want everything ready once the launch opens (especially since we want to use it for our first night paddle of the season). Stay tuned, and we’ll see you out there. Hoping y’all will one day play Jaws at the LSU lakes at night!! !